Does this thought feel familiar? I’m sure it does. And trust me, you are not alone! Plus, piano playing is not just a ‘little job’ you can tick off your list once in a while. Piano playing is a complex art – and mastering it takes a lot of consistent practice …which takes a lot of TIME. So how do we find this time? Stop right there! I promise you, things are much easier than you think! Yes, we live in ‘fast and furious’ times. Every day, thousands of things are screaming for our attention. Demanding our time. In our era, being mindful is harder than ever. Fitting it all in is harder than ever. So how do you clear the smoke? Watch the video – and you will find out! 00:32. “I don’t have enough time to practice…”. Why do we struggle to find time for the things that really matter? 01:42. Solution No. 1. Understanding your priorities. 04:05. Solution No. 2. Eliminating time wasters. Decluttering your day. 07:25. The importance of balance. 07:52. Bonus tip: don’t overbook your schedule! 09:22. Solution No. 3: Discipline. Building good habits. 10:02. Building good habits – the easiest way to become disciplined. 10:58. The importance of starting small in building good habits. 11:45. How to build a consistent practice habit. 14:29. Practicing for 20 minutes on those days when ‘you don’t have any time’. 16:10. Examples of other good habits you can build. 18:51. Long journeys can only be walked calmly, one step at a time :). Always divide big scary tasks into small manageable bits! 20:09. What regrets will you have on your deathbed? An empowering wake-up call. 21:16. Overcoming fear of change. 21:43. Solution No. 4: Go slow, and keep going. Don’t allow discipline to degenerate into tension and hurry! 22:20. Applying the ‘relaxed concentration’ technique. Setting a healthy pace to your life. 23:56. Good pianists are not heroes with super-human abilities! They are just disciplined and persistent people. 24:31. Solution No. 5: Be present. 25:17. Mechanical practice is a waste of time! By practicing mindfully, you are saving time! 26:58. In building your life, make sure you have a vision! Don’t live ‘accidentally’! 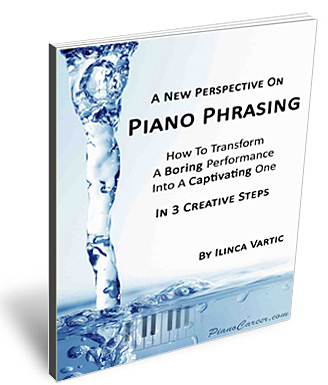 Do you want to take your piano skills to a whole new level of mastery? 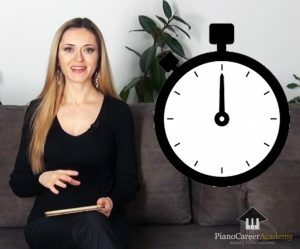 Join my Piano Coaching Program at PianoCareerAcademy.com and get instant access to many hundreds of exclusive, in-depth tutorials for ALL levels (including step-by-step courses and interactive projects) that will transform your playing, and help you to acquire a holistic perspective on our amazing art! So, do you have the time to practice today? Of course you do. And today is all there is . P.S. Follow me on Facebook, Twitter or Google + (and now also on Pinterest!) to get instant updates, support and motivation!